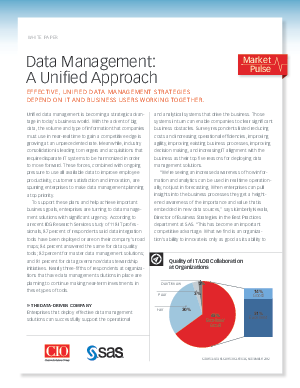 Unified data management is becoming a strategic advantage in today’s business world. With the advent of big data, the volume and type of information that companies must use in near-real time to gain a competitive edge is growing at an unprecedented rate. Meanwhile, industry consolidation is leading to mergers and acquisitions that require disparate IT systems to be harmonized in order to move forward. These forces, combined with ongoing pressure to use all available data to improve employee productivity, customer satisfaction and innovation, are spurring enterprises to make data management planning a top priority.